The Daily Aman epaper is a Faisalabad base stylish green newpapers for the Urdu lover. The Roznama Aman Newpaper's chief editor is Rifat Sarwash. Feroz Faisal is the Editor of Amn News ePaper online. 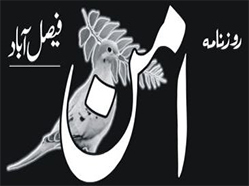 The Roznama Aman epaper is an famous International Newspaper in both English and Urdu Language for the Pakistani folks. The aim/i of the Aman foundation is to promote investigative journalism through the young and active media reporters of Pakistan.